Vi?t Nam will continue to hasten efforts to improve the business climate in terms of quality to create favourable conditions for the private sector to play its role as a driver in promoting rapid and sustainable economic growth. A flight of Vietnam’s budget carrier Vietjet Air from Vinh city in the central province of Nghe An to Ho Chi Minh City on February 6 changed its schedule for a technical check. January saw the start of operations for Bamboo Airways, another budget carrier based in Vietnam. Bamboo Airways, the country’s fifth airline, joins national carrier Vietnam Airlines and its wholly-owned domestic airline, VASCO, as well as two other budget carriers, Jetstar Pacific Airlines and Vietjet Aviation. The Immigration Bureau promised on Thursday to investigate the disappearance of a dissident Vietnamese journalist believed to have been abducted at the northern Bangkok Future Park mall two weeks ago. The central city’s international airport administration, in co-operation with Chubu Centrair airport, Japan, plans to launch daily direct flights connecting Ðà N?ng and Nagoya later this year. Leading Vietnamese tech group FPT will launch a digital insurance venture in March with Germany’s Allianz, pushing further into a growing market, a person familiar with the matter told the Nikkei Asian Review. According to the Global Innovation Index 2018 (GII 2018), Vietnam has recently increased to the position of 45/126 countries and economies. This is the result of various encouraging policies issued by the state as well as local authorities on startup activities. An Australian table grape exporter said his customers in Vietnam have shifted to preference seedless varieties. The Vietnamese dong will not depreciate much against the US dollar in the second half of this year, so the whole year’s slide will be 3 per cent at the most, the Bao Viet Securities Company (BVSC) has forecast. As many as 96 people were killed while 110 others were injured in 144 traffic accidents over the first five days of the Lunar New Year (Tet) holiday, which began on February 2, according to the Ministry of Public Security. 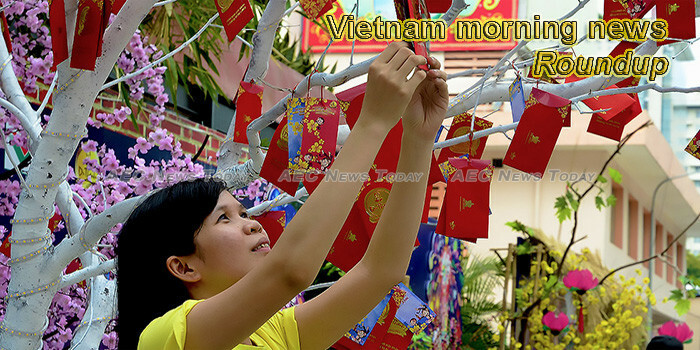 A wide range of activities are being held in a Lunar New Year (Tet) celebrating programme that kicked off on the December 19 Book Street in Hanoi on February 7. The northern province of Bac Giang will host a Culture – Tourism Week from February 14 to 20 with a theme ‘Discover Sacred Land in Tay Yen Tu’. Real estate developers must review their business strategy if they want to keep up with the opportunities set to come from the expected changes to the sector, according to industry insiders.